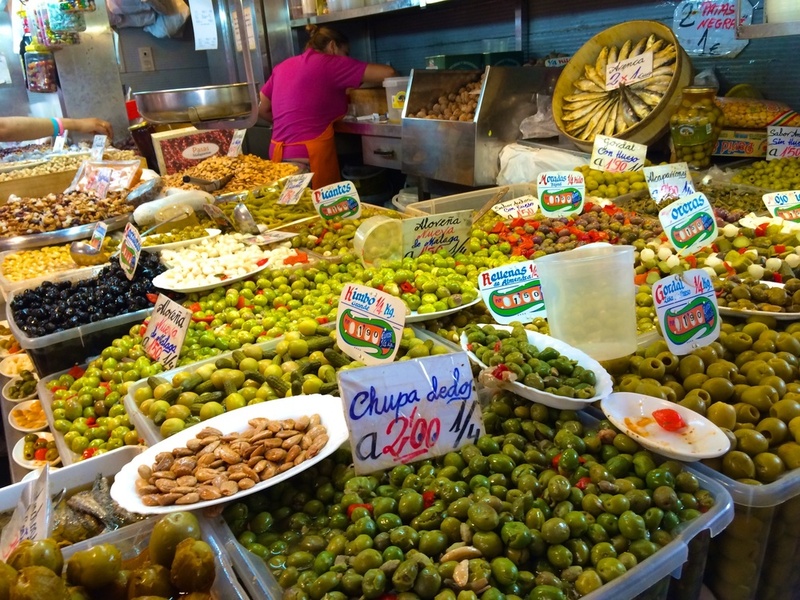 This will be a brief, but colorful post about our trip to Malaga's farmers market. In Barcelona, we visited several markets (such as the Mercat de Sants and the famous La Boqueria on La Rambla), and the one in Malaga was very similar. While walking through the fish and meat markets, I couldn't help but wonder how I am not a vegetarian. Browsing through the fruits and vegetable stalls, however, made me squeal with delight... so fresh and cheap! The market itself is set up in a huge area, and asides from fish, meat, and vegetables, you will find some stalls that sell prepared food. A lot of locals stopped by during lunch time to grab a quick bite and a drink while standing, eating, and chatting away. So far, in all of our traveling, I have to give the Spaniards & Catalans the gold star in their farmer's market quality from what we have seen in Barcelona and now here in Andalucia. Old town Malaga does have some pedestrian only streets full of shops and restaurants. We ended up grabbing some lunch at one of the restaurants, but it was really nothing to rave about. Also, most stores were either closed or closing as we left the market right around the beginning of siesta. Despite Malaga being a happening place, I am glad we picked a small, quiet town away from the hustle and bustle for our stay this month. Beautiful Riogordo, surrounded by mountains and covered with white washed houses and fruit trees, and home to some really kind and helpful people.